It’s always a bit of a shock when baby names trend upward in a big way. Because guess what. Year after year, the most popular names tend to… stay popular. After all, the top four girl names in 2016 were Sophia, Emma, Olivia and Ava. And in 2017, they are Emma, Olivia, Ava and Sophia. Who knew? But then there are the names that zoom into popularity, suddenly and without notice, surprising everyone and kick-starting trends left and right. 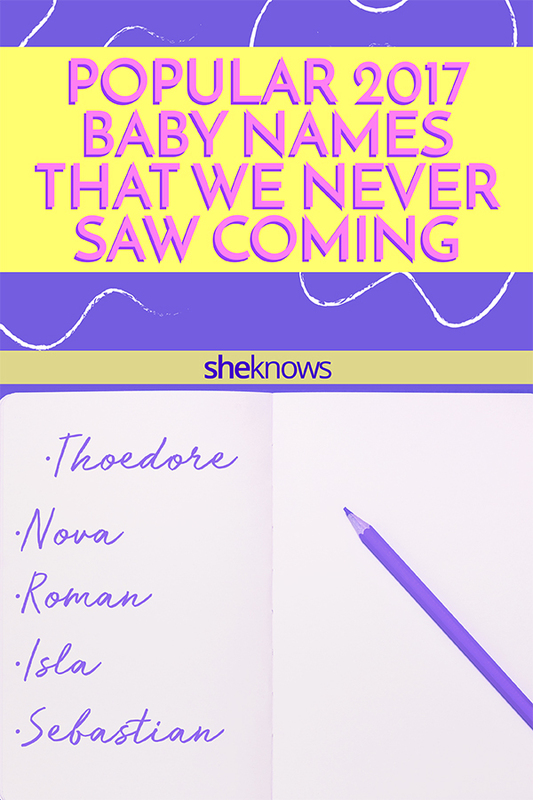 Do you know any kids named Nova, Ezekiel or Valentina by any chance? Well, you will. 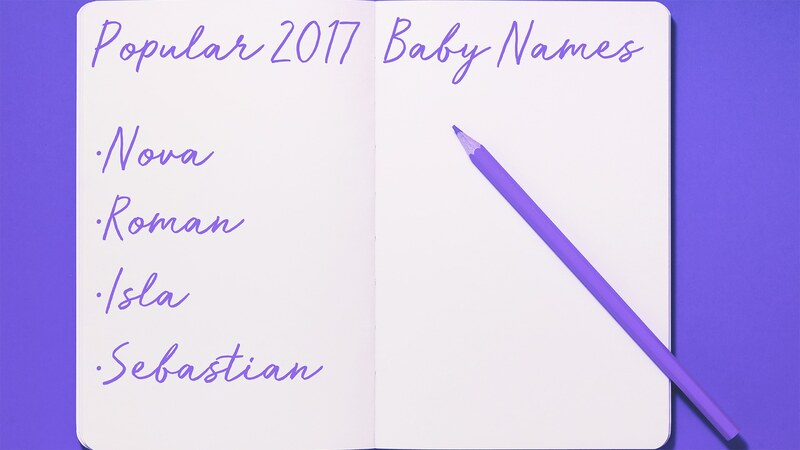 In 2017, several classic names — including Naomi, Sebastian, Aurora and Theodore — have seen a resurgence, while scores of baby girls were given romantic names like Isla, Valentina, Brielle and Mila. Fabulous astronomy-inspired names like Nova and Luna also rose in popularity (possibly due to the eclipse? ), while powerful names like Maverick and Roman took charge. Meanwhile, biblical names like Ezekiel and Levi rose in popularity, and Sawyer gained fans as well (though it’s tough to say whether that’s because of Twain’s classic novel or the hottie from Lost). But while we didn’t see these coming, we have to say we kind of dig ’em. Ahead, check out 17 surprising baby names that made big moves in 2017. Nova means “new” or “young,” and in astronomical terms is used to describe a star that suddenly shines thousands of times brighter and then gradually fades back to its original brightness. It’s also the name of a classic PBS science show (that’s worth a baby name in our books). Luna literally translates to “moon” in Spanish, Italian and Latin. In Roman mythology, Luna is the goddess of the moon. (In Greek mythology, Luna was called “Selene,” which is another unusual and gorgeous name for girls.) Chrissy Teigen and John Legend’s daughter may have contributed to the popularity of this one. Isla means “devoted to God” — its rise in popularity could be partially due to actor Isla Fisher. The word isla also means “island” in Spanish. The romantic name Valentina means “brave,” but we can’t help thinking of a certain love-themed February holiday when we hear it. This moniker may have been nudged into fashion when actor Salma Hayek named her only child Valentina. This throwback name was the raddest in the ‘80s and means “pleasant.” Fans of actor Naomi Watts or country legend Naomi Judd will approve. Mila means “industrious,” and we likely have A-lister Mila Kunis to thank for its popularity. The name Aurora comes from the Roman goddess of the dawn. It’s also used to describe the Northern Lights phenomenon seen in the skies. Are parents naming their daughters Aurora after those swirling colors — or after Disney’s Sleeping Beauty? We may never know. This one came as a surprise indeed. Brielle is an Irish name that means “hill.” Our hypothesis? The name might have become well-known thanks to reality star Brielle Biermann, who has appeared with her mother Kim Zolciak-Biermann on The Real Housewives of Atlanta — and probably 3,488 of its spinoff shows. Yep, this name’s meaning is as straightforward as it seems: “from Rome.” Fueled by Americans’ love for all things Italian or by Cate Blanchett’s son Roman? Sawyer means “cuts timber” and was once used to indicate a person who worked in logging. Its popularity likely comes from Mark Twain’s Tom Sawyer or Sawyer on the endless ABC drama Lost — or both. Jameson means “supplanter.” But hey, if you name your kid after whiskey, that’s totally cool too. It’s also the name of Pink’s son with motocross star Carey Hart. This sweet old-fashioned name means “God-given.” It was the name of one of America’s most beloved presidents, Theodore Roosevelt, and also writer Theodor Geisel, aka Dr. Seuss. Oh, and a chipmunk. Levi means “associated with him” and is another biblical name. In the Old Testament book of Genesis, Levi was the third son of Jacob; today, he’s the first son of Matthew McConaughey. Another adorable throwback name, Sebastian, means “revered.” This name can be found all over popular culture, so take your pick: Shakespeare’s Twelfth Night, Disney’s The Little Mermaid or Tommy Hilfiger’s son.